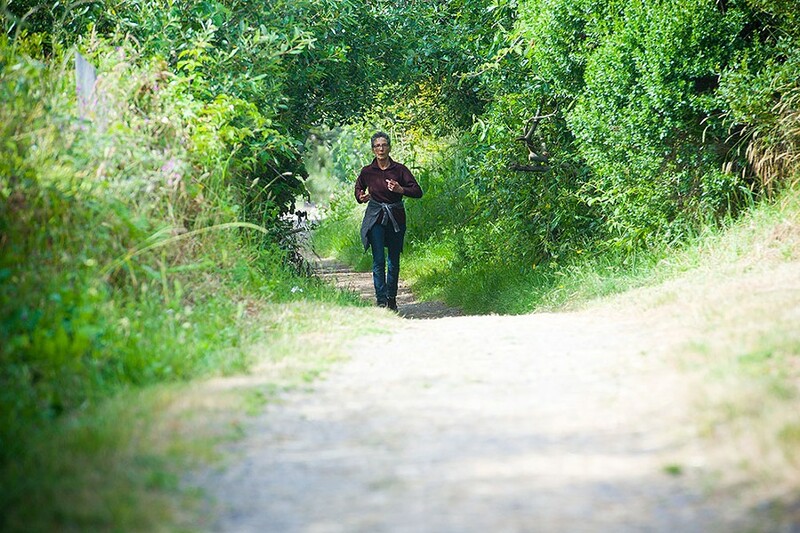 Photo by Mark McKenna A runner on the Hammond Trail. It's a bummer: My body at 67 is not what it was at 20, 30 or even 40. I've had to give up five or six physical activities, and each time I let go, adapting to the new reality is bittersweet. For instance, I started jogging in college and ran consistently into my early 60s, including three marathons on both coasts. My personal best was 3:56 at Big Sur, where I'd been enticed by a marketing pitch I couldn't refuse: "Run along the edge of the Western world." My favorite part of the route was a challenging but exhilarating 2-mile uphill incline dubbed "Achilles Hill," where, at the top, a pianist serenaded us. What I loved best about running was the sweat. I'd come back from a run dripping, every square inch of my skin slick and happy. Hills were my favorite. When driving to Arcata, I'd stop in Indianola and run up and down the steep private driveways along Hidden Valley Road. I have almost no cartilage in my right ankle (skydiving accident, long story). Four years ago, an orthopedic surgeon looked at my X-rays, shook his head and said, "I'm amazed you're not using crutches. It's because you're so active. Keep it up but no more running." The end of an era — one of many. Inline skating also came and went, too. When I lived in Palo Alto, I'd wake up early yearning to move and within minutes would be gliding along silky, dreamlike streets, inhaling the scent of magnolia blossoms. The cars slept in their driveways and all was still. But when I moved to Eureka 17 years ago, skating the pot-holed pavement was rougher. I didn't feel as brave on the inclines and I drifted away from skating. With running and inline skating behind me, I cast about for a new sport that would provide aerobic benefits. I started swimming, hiring a swim coach to teach me better form. I'd drive from Eureka to Arcata and swim in the community pool, which was fine. Not exciting, not sweat-inducing but fine. But driving to swim? Getting in a car to go exercise has always struck me as counter-intuitive. One day on my way to Arcata, with the bay on my left, I imagined the C Street dock, only a block from my home, calling me. Why not skip the drive, the traffic, gas and pool fees and just stroll down to the bay? 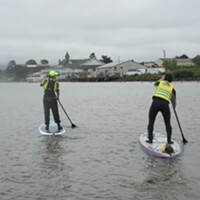 I learned from Baykeepers that Humboldt Bay is clean enough to swim in. (How could it yield one of the most abundant oyster crops on the West Coast, if it weren't?) In my newly-acquired shortie wetsuit, I slipped into the water early one March morning. It was bracing but not unbearable. For months, two homeless guys named Jack and Will would meet me every morning and wave me off. My husband Barry would sometimes join me in his kayak. I'd swim either south to the Eureka marina or north toward the Adorni Center. 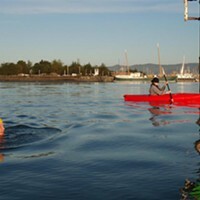 The bay is a busy place, with rowers, Humboldt State University scullers, kayakers, fishing boats, seals and the Madaket. I wanted to head out into the bay but my cautious husband worried I wasn't visible, even with my rainbow cap, so I usually hugged the shore. Sometimes it's not age or health that makes me leave an exercise behind but me and my urge for something different. That was the case with swimming in the bay. Early one morning, while doing the breaststroke, I saw a figure in the distance who seemed to be walking on water. He looked mythic, out of biblical times. Not long after, our surfer neighbor showed us his new toy: a stand-up paddleboard. I wanted one. He was savvy about water sports and found me an inflatable board online, one I could roll up and take in our camper van when we left town. Last year while camping in central Oregon, I went paddling every day on a different body of water. I still miss running. Sometimes I glimpse a winding hilly road, with pillowy meadows on either side — a perfect candidate for a jog — and follow the contours wistfully, imagining myself running up the hills, panting. But I'm not who I was when I started running at 20, or even at 40, when I bought rollerblades. Not fair! I want to be my younger self, she whose feet could run for miles and miles, even in cheap running shoes. She who blithely skated, skimming along the pavement, bending her knees, wanting to get closer to the surface of the earth. No longer. Meanwhile, though, my paddleboard is whispering to me. Before long I'll be lost in another world, weaving my way deep into the Indian Island slough below the egrets and blue herons perched high in the cypress trees. 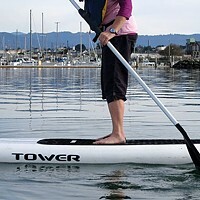 And the other night, falling asleep, my mind turned for the first time to paddleboarding, not running. As one exercise dies, another arises. Growing up, Louisa Rogers sucked at PE but, to her surprise, became an adult-onset lover of movement.